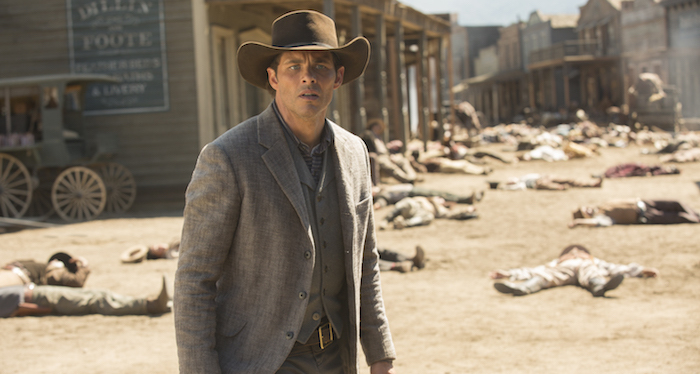 A busy episode of Westworld leaves us with a head-spinning array of unexpected questions. Warning: This contains spoilers for Episode 6 of Westworld Season 2. Haven’t seen it yet? Read our spoiler-free review of the season’s opening episodes, or click here to find out how to watch it online. Westworld Season 2 reaches a turning point as it enters its second half, serving up an episode that’s bursting with ideas and revelations. Episode 5 of this sophomore run focused on Shogunworld, as Maeve and Lee Sizemore continued their delightfully meta adventures in Delos’ second theme park – a striking contrast to Episode 4, which was dedicated to Dolores, Teddy and Bernard. Now, the writers cram both halves of the story together, resulting in an hour that’s a little too chaotic, but compensates for the overstuffed script with a whole bunch of unanswered questions. For Dolores, the main question is whether she regrets turning Teddy into a sentient, unsentimental SwaggerBot, after hijacking his computer and overriding his settings. It was a cruel betrayal, one that didn’t exactly remove his free will, but removed a lot of his heart and character traits. James Marsden sinks his teeth into the chance to play against type; his chiselled, heroic appearance is no longer accompanied by a well-meaning smile, but replaced by a blank, colder expression. He’s the one who hurries her along, as she sits in the Sweetwater brothel and plays the piano. Where he once would have gone along with her and done anything she asked, he now snipes passive aggressive comments about what she changed in his personality – he’s not only aware but also a little bit angry about it. As well as giving Marsden a welcome chance to do something different, it gives us a rare glimpse of Dolores not being in full control of her situation – something that bodes well for future episodes, after Evan Rachel Wood’s imperious crusade has threatened to become repetitive. As they board the train to the Mesa Hub, turning it into a bomb to attack the heart of Delos’ operations, the tension between our once-happy couple is a marked contrast to the more cheery union going on in Maeve’s camp. 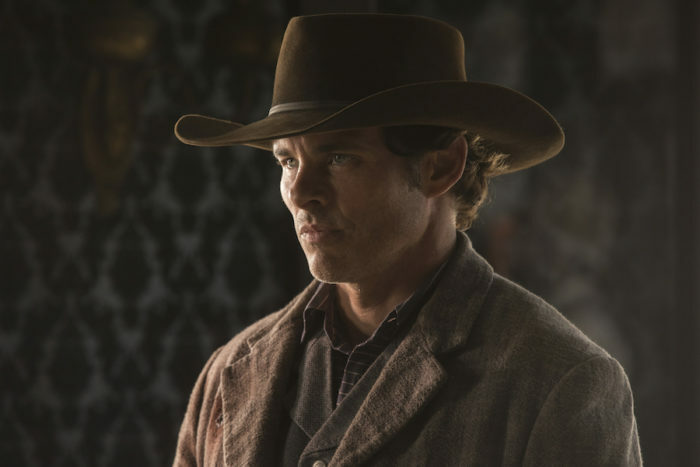 She even thanks Lee, after he guides them to a way from Shogunworld to Westworld – a nice moment of camaraderie that highlights how much Maeve, unlike Dolores, is happy to let others genuinely explore their freedom. (“We each deserve to choose our own fate,” she argues.) She could use her powers to reprogram everyone, but she chooses not to – especially when Musashi challenges Tanaka to a duel to determine the fate of Akane. Rather than play the part of a witch, she stands to one side and lets them act out their honourable parts – and give us a dazzling burst of sword fighting. 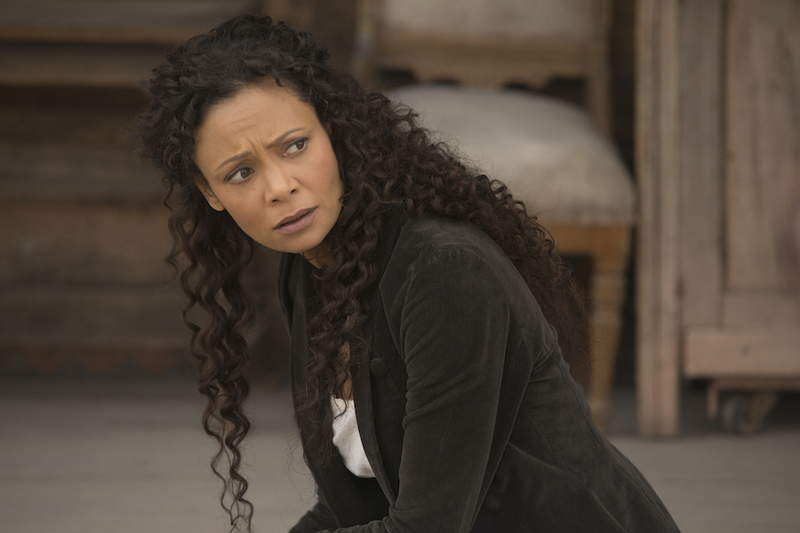 Once back in Westworld, Maeve doesn’t waste a second in rushing to her old house (Lee’s directions really are spot-on) and finding her daughter. The music soars, the corn fields glow in the sun and her sorely-missed child… doesn’t remember her. 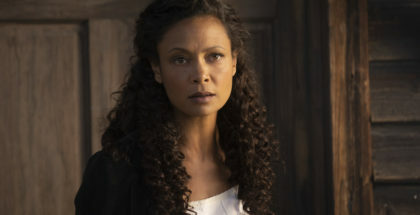 It’s a brutal blow for Maeve, and Thandie Newton acts the moment with heartfelt sincerity – a rare chance for her character to be more than a fierce rebel with a steely glare. It is, of course, only natural for her daughter to have been given a new mother, just as Maeve was wiped and given a new role – and realising that at the same moment as she does is a wonderful piece of rug-pulling pathos. If this were Dolores, she would simply hack in and overwrite the girl’s operating system. But this isn’t Dolores, and Maeve has to face the fact that her struggle, at least to her daughter, has been meaningless. Nonetheless, she whisks her away when the Ghost Army attacks the homestead (as their narrative dictates they must), which suggests there’s still more to come. 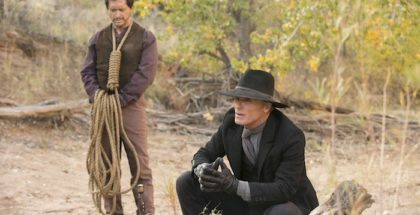 Both of those moments could be enough to fill a normal episode of Westworld, but the writers also find time for some more parental drama with The Man in Black, who, when we last saw him, had just bumped into his daughter, Grace. Here, we see them have a long-awaited heart-to-heart, and both actors bring a lived-in quality to their long-standing conflict. There’s reconciliation in the air, though, as she reassures him that he wasn’t to blame for the suicide of his wife (and her mother) – and the knowledge that she has put aside that grudging blame is enough to make old William smile. She asks him to leave the park with him, rather than continue to pursue his self-indulgent fun in a virtual world, and he agrees, promising to leave at sun-up. When she wakes up after sleeping by their campfire, though, he’s already disappeared with his men – a wry bit of humour, and a reminder that even with their relationship mending, The Man in Black still isn’t a nice guy. It’s an about-turn that matches the Maeve reveal, as it quickly emerges that Dolores, not Bernard, is the one hosting these conversations – after Season 1 revealed their chats to be taking place in a different time period, it was only a case of waiting to see what re-contextualising Season 2 would offer to spin our heads once more. Specifically, it’s that she’s been performing tests on Bernard over and over to check for “fidelity”. That not only means she can order him to “freeze all motor functions” and it works (poor Bernard just can’t catch a break when it comes to his motor functions), but it also means that Bernard is, like Jim Delos from a couple of episodes ago, officially some kind of robo-clone of Arnold. Does that mean that Dolores has created her own version of Arnold and is trying to bring him back? Or does that mean Dolores is undergoing some kind of reprogramming of Bernard, and this accounted for the weeks of memory he can’t recall? Or, given her ability to tell him to freeze, is Robert Ford somehow inside the body of Dolores and using her to carry out the Arnold cloning process that he started years ago? Why would Robert Ford have anything to do with it? That’s the episode’s second twist, which comes right at the end. With Elsie and Bernard trying to debug the Delos system, they realise that the Cradle (the digital network that connects all the hosts and generates each story variation) is improvising and defending itself from every Delos company hack. To try and find out where that code is coming from, Bernard convinces her to take out his brain (a little black ball – not a red one, as we’ve seen him handling before) and insert it into the mainframe. The result sends him on a Being John Malkovich-like trip into a virtual version of Westworld, even taking the train into town. When he arrives at the Sweetwater bar, who should he see playing the piano? Why, Robert Ford himself, who greets his old friend with a smile. Ford, as we saw in Season 1, was most certainly shot dead by Dolores. Which means that his mind, or at least a digital copy of it, seems to be floating around the ether of Delos mainframe. Is that the red ball that Bernard secretly uploaded during his memory blackout? Was he programmed by Robert to either insert his digital mind into the gigantic computer? Or did he create a clone copy of Robert, upload his mind there, and Ford is now playing merry havoc out of sight? The questions are endless, not least because it’s still not entirely clear when all of these sequences have been taking place – and, indeed, where they have been taking place, either in the real world or the virtual world inside the Cradle. 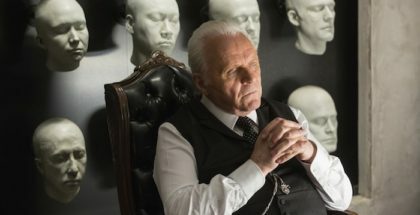 It’s a conundrum that opens up Westworld’s horizons even further than expected, throwing everything into potential doubt and taking the existential debates about consciousness that the show thrives upon to new heights. It also means that we’re still not sure who’s a host and who’s not – as well as Arnold and Jim Delos, the sudden dose of uncertainty injected into proceedings means that everyone from Ford and The Man in Black still can’t be ruled out as robo-clones (the latter being a particular favourite theory of ours). Hell, even William’s daughter could be, if Ford was planning to torment the old guy. The result is an episode that’s a little to busy to truly stun, but one that puts HBO’s sci-fi firmly back on track to surprise us all in the coming episodes – news that will be welcomed by those who have been disappointed by the sophomore run’s more straightforward serving of violent retribution. Hello, old friend, indeed. What’s coming soon to Sky and NOW TV in June 2018?